Like most of the small business owners we work with, I’m guessing you got into business for yourself because you wanted the flexibility to set your own hours and you didn’t want to have to answer to anyone else; set your own rules and expectations. But, once the dust settled and the excitement of the first-steps, you quickly found you were working more hours in the daily grind than you first expected to so you could either get the business off the ground our just keep it moving forward. And, no one knows your business like you, so that means even more responsibility. The year 2019 is begging you to be different and Carefree Bookkeeping wants to help! We’re hosting a “Design Your Business to Run Itself” Post & Win Event! 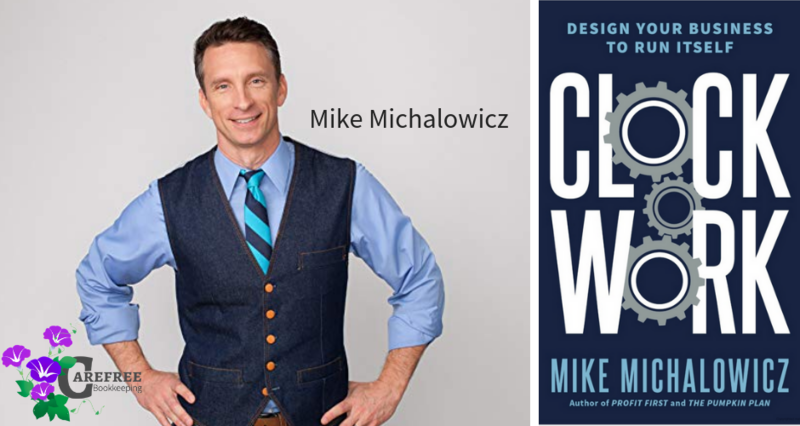 A free 25 minute consult with Carefree Booking PLUS a FREE hardcopy edition of Clockwork by best selling author, Mike Michalowicz. In this indepth and insightful look at successful small businesses, you’ll discover a simple and intuitive approach to creating efficient processes designed to free you up in life and at work and find more balance. Regardless if you are a business of one or many, you will be able to develop an organization that gets things done while you focus on doing what you want to do. Each person gets one entry between January 21st and February 11th. Carefree Bookkeeping will work with an independent party to pull the entries and draw one lucky winner who will be posted on our Facebook page on February 14th. Then watch our Facebook Page @CarefreeBook for the Winner to be Announced on February 14th!